An underlying problem for suppliers is the time it takes to action a new release and the ability of management to examine the ramifications of any changes. The process is inherently difficult and error-prone, often resulting in the supplier incurring penalties for stopping the OEM's assembly line. The supplier is neither able to check timely that the OEMs are adhering to the contract, nor do they have time to establish their own capability of meeting the new requests. This results in missed delivery dates, emergency purchasing and production control in a permanent state of expediting. The Blanket Sales Orders and Releases system is designed to address these problems. Blanket Sales Orders and Releases enables the easy capture or import of a new release and provides the necessary tools to manipulate the release and advise the customer of what has been accepted or changed and why. 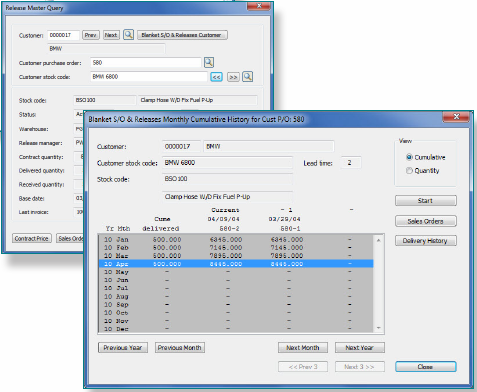 It enables updating of existing scheduled orders automatically, and provides an audit trail of deliveries so that disputes over quantities supplied to date can be resolved. It also enables the various tasks to be subdivided so that the appropriate level of staff can be employed for each function. If you are interested in learning more about award winning erp sofware and the full benefits of Blanket Sales Orders and Releases, download the fact sheet.